Your product launch is no doubt a major event in the company calendar and is your businesses opportunity to showcase the product or service that has been in the planning for months or perhaps even years. How do you make sure that your launch creates an un-rivalled vibe that ripples through your industry and firmly places your brand in the mind of your target audience? In today’s fast paced, marketing frenzied world, what does it take to stand out from the crowd and conceive brand advocates? How you position your product at its launch will be remembered and can set the tone for its journey into the market place. Whatever story you create for your product, bring it to life with a set design that transforms a venue space and clearly drives the personality of your brand to deliver maximum impact. 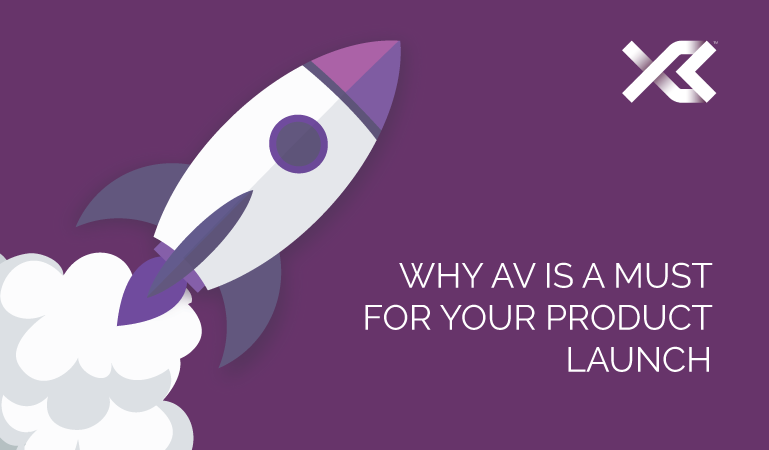 Tell your AV team your vision and work with them closely to develop concepts that capture the essence of your product. If your AV supplier works with 3D rendering software, you can even see in exceptional detail how your initial ideas would look in reality; allowing you to select the right creation that can be developed by your AV team into an incredible physical installation that will WOW. You’ll want to showcase your product in the best light possible and that’s where a well-thought-out lighting scheme can amplify the setting of your launch and create an amazing effect that transforms the space and sets the mood for your event. Your AV provider will have extensive knowledge on which lighting systems will work best to produce an ambience that complements your set design and aligns with your overall launch image. Product launches are an opportunity to engage with prospects who now, or in the future, may be interested in purchasing your product. Maximise the power of your platform and find out how your AV supplier can support in the creation of visual event content that is not only entertaining but insightful and informative. Inventing and implementing attention grabbing content ideas can help communicate the unique selling points of your product and fundamentally shape the attendees experience of your brand. Impressive content needs to be seen. Depending on the nature of your launch, the range of techniques that can be used to project your content are impressive. From wide-screen displays and HD projectors through to projection mapping technology, the power of your imagination can be harnessed by audio visual equipment that pushes the boundaries of what you thought would be possible. With such a spectacular event lined up why limit exposure? Take your launch event to the masses and live stream, allowing audiences who aren’t in attendance to experience the wonders of your launch first-hand. Live streaming can also help create a buzz and urgency to consume content, which is exactly the momentum you want to produce for your product. It doesn’t end there: AV solutions such as event recording, can provide promotional collateral that can be used as part of your wider marketing strategy after the event is done and dusted. Optimise the ROI of your launch event and continue to drive awareness and interest with video content that packs a punch. Utilising audio visual production can help to make your launch an introduction that counts – take industry insiders, commentators and brand fans on a journey that they won’t forget and make your launch event a spectacular that people can’t wait to talk about and share. Awe-inspiring experiences, underpinned by customised AV solutions, transcend walls of venues and filter out through social channels and other sharing platforms, allowing audiences to discover your new product and brand. X3 Solutions are specialists in AV production for live product launches and work with your brief and budget in mind to turn your event vision into a reality. Having worked with many clients across different sectors and around the world we have the experience and expertise to manage your project from start to finish. We work collaboratively with you to deliver an experience for your audience that will captivate and propel your brand into the forefront of their minds. Tell us your AV requirements today: Call: +44(0)1252 519303 Email: info@x3solutions.co.uk.